The increased demand for the best trampolines with enclosure now means that most tramps ship with these safety nets from the factory. Let not your need for an enclosure blind you to other important aspects that also matter a lot when buying the perfect trampoline for your family though. It’s important to ensure that the tramp offers enough bounce to the jumpers because, well, that’s exactly what they are supposed to do. Our top 10 enclosed trampoline reviews bring you trampolines that offer a good mix of both safety and fun. Quality matters a lot especially if you are planning to spend several hundred dollars on an outdoor trampoline. Skybound understands this better and their Stratos is hard to beat in almost all the fronts that make the best large trampoline with enclosure. It’s easy to tell that the Stratos is a high-quality, sturdy trampoline simply by looking at its images. Its frame, which boasts a 10-year warranty, is made from top-class steel that has been painted black to prevent early rusting and to allow you to leave it erected all year round. The net is of premium quality too and has been designed in a way that protects the jumper from reaching the support poles no matter the force they are flying at. The enclosures poles still have a thick padding though (just in case). The Skybound Stratos comes in 3 sizes; 12ft, 14ft, and 15ft with lower prices on the smaller models. These trampolines are fitted with 84+ 8.5-inch springs that offer an incredibly high and smooth bounce. The Skywalker Trampolines 15-feet round trampoline held the best-selling tag throughout 2018 and might continue to do it in 2019 as well. This is one of the best trampolines for kids with enclosure and it offers a lot of jumping surface and a basketball to boot at an incredibly low price tag. The enclosure itself is made of polyethylene- a material that we highly advocate for thanks to its excellent resilience even when exposed to elements. It’s tightly woven to avoid trapping small fingers and has good flexibility to throw the jumpers inside the mat without causing bruises. We also like that the net is attached directly to the jumping mat to make this tramp gap-free and to avoid hands and legs from being caught and bruised by the spring system. Speaking of the springs, this trampoline 15ft with enclosure has 96 of them each measuring 6.5’’ long. These springs coupled with the 200-pound weight limit means that this trampoline is marketed mainly to kids. Rectangular trampolines rule the roost in terms of bounce and they also offer the biggest jumping surface. These 2 features render them the best trampolines for gymnastics. What we have next is a 10’ by 17’ tramp that has a lot to offer in terms accelerated performance, quality, and durability. One thing that we really like about the Jumpsport Stagedbounce is that its heavy-duty frame is crafted from cold-rolled steel. This steel that has been strain-hardened to make it up to 20% stronger than the hot-rolled steel that most average tramps use. The jumping mat which measures 8’ by 14’ is bound to turn heads as well. While most tramps are fitted with a polypropylene mat (which is the most recommendable, by the way), Stagedbounce uses Permatron mat. Permatron consists of high-quality polypropylene that is loaded with carbon to give it high-tensile strength and excellent resistance to mold, water, and UV rays. The JumpSport boasts 108 high-performance springs that have been crafted with bounce in mind. But what’s so impressive about them is that they use stagedbounce technology which consists of alternating v-ring lengths. Basically, this technology offers the jumper smoother jumps and more forgiving when landing. The best trampolines with enclosure don’t always cost the earth as the Zupapa 12’ round trampoline shows. This tramp might be worth considering if affordability without compromising on quality is your major concern. The very first thing that we love about this model is that it is available in 3 sizes; 12ft, 14ft, and 15ft. Each of these sizes is sold at a different price with the 15ft trampoline being the priciest. Basically, Zupapa has a tramp for any all families regardless of their yard’s size and budget. The standout feature of these trampolines is how they offer a gap-free jumping surface without having to attach the net directly to the jumping mat. The 12ft round trampoline with enclosure that we are looking at here offers a 10.4ft worth of jumping area while its 15ft sibling gives the jumper 13.25ft of usable area. This tramp has the highest weight limit so far for a trampoline in its class at 330lbs. This can be attributed to the deep galvanized 1.5mm thick steel tubes used for the frame and the 6 w-shaped pairs of legs. We are also huge fans of all the free accessories that this model ships with; a mat rain cover, ladder, 6x wind stakes, 2x T-hook, and 2 pairs of installation gloves. The Merax is for parents who are looking for an affordable round trampoline with safety enclosure. But it has a lot more to offer besides. If you have an upcoming basketball enthusiast in your house, this trampoline’s basketball hoop will be the right place for them to perfect their shooting skills. This hoop has a 13.4-inch rim that allows the jumpers to use virtually any basketball. But what you’ll definitely like is that the hoop hangs on its own padded pole for optimum stability. Most manufacturers often cut corners in terms of construction materials when the affordability of the tramp is crucial. But the 330-pound weight limit of the Merax is an indicator of the quality of frame and mat used to craft it. This high weight limit allows several kids to jump at once (albeit not recommendable) and even an adult and a kid. With regard to safety, the spring system is outside the jumping zone and it has a concave design that offers another level of safety when the jumper shoots towards the padded posts. The Lily Pad Adventure is a baby trampoline with enclosure that is designed to keep your toddlers active while preparing them for bigger trampolines in future. This mini bouncer is the smallest in Skywalker’s line of kids’ bouncers measuring 40 inches. This size makes it a perfect pick if you are looking for a tramp that you can use both indoors and outdoors depending on the weather. The Lily Pad offers a jumping surface of 6 sq.ft. and has a weight limit of 100lbs. The good news is that it uses 25 elastic bands in place of springs. This completely eliminates the issue of scratched fingers and the bands have also been covered to prevent little feet from plunging through. Still on the issue of safety, this kids’ trampoline has a frame height of 14.6 inches that will keep even the bounciest kids inside the bouncer. There is also a 360-degree padded handlebar that offers additional stability and a lower enclosure net that prevents the kids from crawling beneath the jumping mat. This tramp also features in our other collection of the bounciest trampolines in the world. So, if you are looking for a safe tramp with a lot of bounce, this could be it. What sets this trampoline aside from other rectangular tramps is its 140 springs that are actually 10 inches long. This is hands down, the perfect combination for a tramp that is meant to send the jumper into the skies. The spring system again gets a really good boost from the cross-sewed polypropylene mat. Acon says that it has been cross-sewn 10 times for optimum agility and UV-treated for durability. There is yet another feature that you’ll definitely like about this trampoline: it has no single user weight limit. This means that you can have several kids jumping in it at once and even adult and a kid. You must have heard of the Little Tikes 7’ trampoline, have you? This is a popular mini bouncer that is designed to offer ‘big-trampoline-fun’ in a small-sized tramp that won’t grab lots of space wherever you decide to place it. Similar to the Skywalker Lily Pad that we saw earlier, the Tikes can be set up and used both indoors and outdoors. However, while it’s easy to assemble it, it might be quite hectic to disassemble. The good news is that it is crafted to withstand even the worst weather conditions. Thus, it can be left outside without the risk of being damaged by the elements. The Little Tikes is a spring-based trampoline with a polypropylene mat and a polyethylene net with zipper. The frame is made of blow-molded plastics while the posts are high-quality steel with adequate padding. For those who don’t mind spending a little bit more on a high-quality trampoline, the Springfree Jumbo Round might be what you are looking at. As its title suggests, this trampoline does not rely on a spring system to create its bounce. Instead, it is fitted with flexible composite rods that produce smooth, non-jarring bounces. 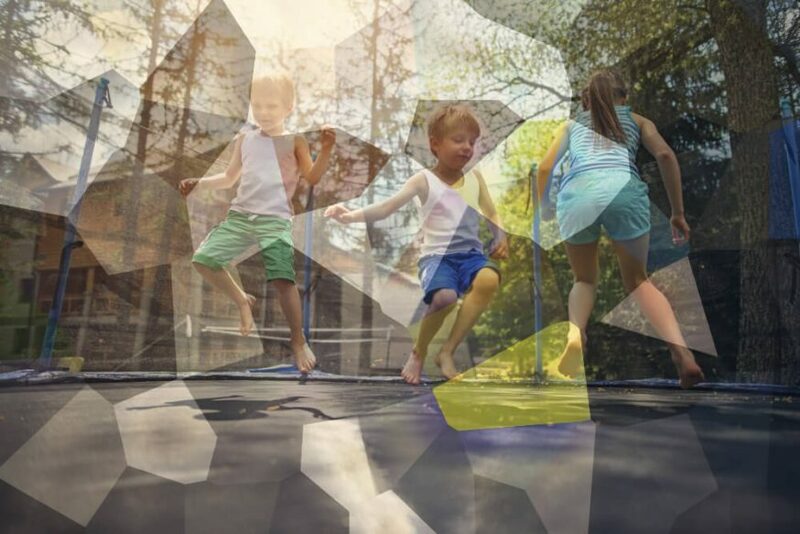 What makes spring-free trampolines the safest trampolines in the world is that they eliminate 2 common hazards that plague spring-based tramps. First, the mere fact that they are spring-free means that the risk of fingers and feet getting trapped and cut is highly minimized. Secondly, these trampoline’s frame is located way below the mat unlike in a conventional tramp where the frame is located along the edges. As such, there is no way the jumpers are going to slam their head on the frame even when the stunts go horribly wrong. This inconspicuous trampoline for kids is designed to offer your young jumpers hours of fun from toddlerhood up to when they can bounce on a bigger trampoline. The Clevr is meant for kids above 2 years and it’s low to ground so it does not necessitate the use of a ladder to get in and out. One thing that most parents can’t stop raving about is its all-weather construction design. This trampoline can be used both indoors and outdoors. We find this very practical especially for people who live in areas that are ever raining and during the winter too. As far as your kid’s safety is concerned, the Clevr has a cleverly padded spring system, padded enclosure posts, and a zippered polyethylene net that holds the jumpers in. The steel base is also strong enough and won’t wobble even with the most playful kids. The net enclosure can be made from polypropylene or polyethylene. The latter is the most preferred thanks to its excellent flexibility that boosts its resistance to breaking even under pressure. In addition, polyethylene does not absorb water and it’s also resistant to mildew and molds. This makes it a good choice especially if you’ll be leaving the trampoline erected throughout the winter. If you are eyeing a spring-based tramp, you’ll want to consider how it is attached to the frame of the tramp. Most of our picks in our reviews of the best trampolines with enclosure above have the net connected directly to the mat. This is a thoughtful construction design that puts the jumper out of harm by putting the spring system and the metallic frame out of the jumping surface. Does the shape of the trampoline matter? Yes! The shape of the trampoline determines whether or not it will fit in your yard. Rectangular trampolines are ideal for narrow yards while round tramps make the best choice for big yards. Rectangular and square trampolines also offer the best performance in terms of bounce and are, therefore, the best trampolines for gymnastics. If safety is your major concern though, you might want to consider a round trampoline since it tends to pull the jumper towards the center. An enclosure system is the first step towards safe trampoline use. This is an important addition that prevents you and the jumpers from shooting off the jumping mat onto onlookers and hard surfaces. However, remember that getting the best trampoline with enclosure alone does not guarantee optimum safety for your kids. Put in other words, not even the best enclosure net can protect an adventurous kid from injuries when jumping from the roof of a building onto the tramp. That being said, always grab a chair and supervise them as they do their thing.